We’ve much to be thankful to the USA for. From Hollywood to New York cheesecake, Barack Obama to Beyoncé, our special friend across the Atlantic has contributed to modern culture in a way that few countries can match. But, in this writer’s opinion, nowhere is that influence greater than on the road. While it was a European that invented the motorcar, it was an American, Henry Ford, who brought motoring to the masses. And since Ford’s Model T, the US has remained at the forefront of automotive innovation. It’s true there were a few off years in the 1990s and 2000s, but we think Motor City is back on top form. So here are a few of our favourites from across the pond. The definitive American sports car, the ‘Vette has been an icon for over 60 years. The current iteration, the C7 Stingray, looks just as jaw-dropping as the Corvettes of yore; so low that you’d almost believe it was glued to the floor, which seems to extend the nose in ways physics can’t quite explain. This combination gives it the sort of presence you normally need to go up a couple of price brackets for. And with a 6.2 litre V8 it has the performance to match (even if it drinks more than a herd of cowboys at a hoedown). At a shade over £60k, it’s also a more attainable car than much of Europe’s speedy metal. For everyone who sits on Team ‘Vette, there’ll be an opposite on Team Mustang. 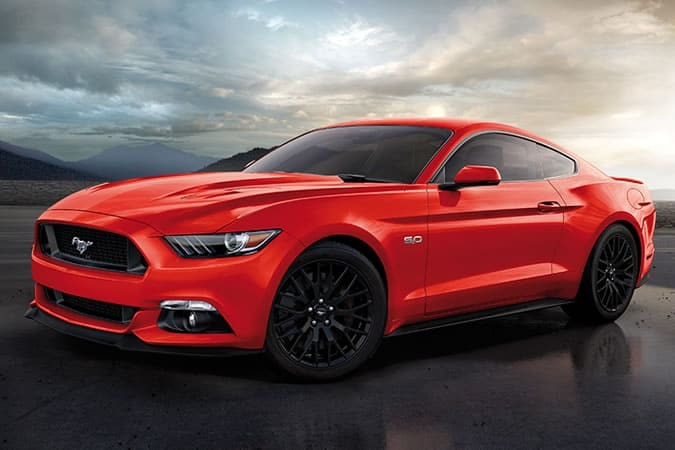 Now, for the first time in its history, the Mustang is available as an official import in the UK. It’s a little more conventional in its looks than the Corvette, but that doesn’t mean boring. It still has the sort of menacing presence that’d scare your grandmother, and a sound to match. Like the Chevy, the quality’s not quite up there with European equivalents, but at just £33k, the modern iteration is far, far better than it was. It’s also available in right-hand drive, which is a blessing when piloting something that hits 155mph in under five seconds on British roads. Moving from muscle cars to super saloons, the CTS-V is everything you don’t really expect a Caddy to be. For a start, it’s not the size of a small town, and it doesn’t come complete with a driver you’d expect to see in a Floridian retirement complex. The CTS-V is modern and menacing. In another break with the past, the CTS-V is more than equal – in both performance and build quality – to offerings from Audi, BMW et al. and, with 640bhp on offer, it goes faster than a well-hit baseball. Granted, its looks are a little startling. But the point of a car like this is to be seen, right? Though somewhat less illustrious than the ‘Vette and Mustang, the Viper is still an American legend. It looks more brutal than either of the aforementioned cars (and neither of them are shrinking violets). The 8.4L V10 generates over 640hp, and that shows. It’s loud, very loud – both inside and out. It’s also the sort of motor that feels like it’s hurling you to your destination, rather than taking you to it. You can’t get your hands on this one just yet. The GT was revealed at the Detroit motor show last year. This is the second iteration of a spectacular motor. The original (itself a tribute to the GT40 of the 1960s) was a showstopper, but 2016’s take goes one better. There are, allegedly, small tweaks to be made to the styling, but we see nods to the GT40, the previous GT and – we think – there’s something a touch McLaren-esque to it too. With promises of over 600hp, it’s likely to perform as well on the road as it does in your garage.